(Leah Hogsten | The Salt Lake Tribune) Danny Guerra and his colleagues celebrate the positioning of the last steel beam, topped with a tinsel decorated tree, during a topping out ceremony at the new Salt Lake City International terminal building, Wednesday, May 23, 2018. Such ceremonies can be traced to Scandinavian rites to place a tree atop a new building to appease the tree-dwelling spirits displaced during Construction. (Leah Hogsten | The Salt Lake Tribune) Thousands of workers from all trades attended Wednesday's topping out ceremony to raise the last steel beams to a high point on the new Salt Lake City International Airport terminal building, Wednesday, May 23, 2018. The new $485 million terminal building will cover 866,087 square feet and used 11,000 tons of structural steel and 22 miles of steel piles. (Leah Hogsten | The Salt Lake Tribune) l-r Giovanni Zavala and Adolfo Velazquez with Pete King Framing sign their name to the beam during Wednesday's topping out ceremony to raise the last steel beams to a high point on the new terminal building, Wednesday, May 23, 2018. The new $485 million terminal building will cover 866,087 square feet and used 11,000 tons of structural steel and 22 miles of steel piles. 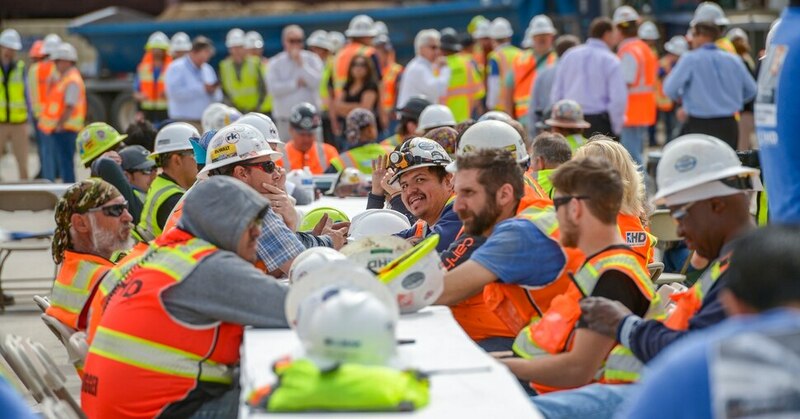 (Leah Hogsten | The Salt Lake Tribune) Thousands of workers from all trades attended Wednesday's topping out ceremony to raise the last steel beams to a high point on the new Salt Lake City International Airport terminal building, Wednesday, May 23, 2018. The new $485 million terminal building will cover 866,087 square feet and used 11,000 tons of structural steel and 22 miles of steel piles. (Leah Hogsten | The Salt Lake Tribune) Construction workers from various trades celebrate the last steel beam on the new $485 million, 866,087 square foot, Salt Lake City International terminal building, Wednesday, May 23, 2018 (Leah Hogsten | The Salt Lake Tribune) Alan Bright, Design Principal for HOK and the design architect for Salt Lake City International Airport's new terminal signs his name to the beam during Wednesday's topping out ceremony to raise the last steel beams to a high point on the new terminal building, Wednesday, May 23, 2018. The new $485 million terminal building will cover 866,087 square feet and used 11,000 tons of structural steel and 22 miles of steel piles. (Leah Hogsten | The Salt Lake Tribune) Iron Workers (not in order) Mike Herrera, Chance Bogue, Curtis Loya, Kevin Johnson, Jeff Wilber and Irving Benally with Local Union 27 position the last steel beam, topped with a tinsel decorated tree, during a topping out ceremony at the new Salt Lake City International terminal building, Wednesday, May 23, 2018. Such ceremonies can be traced to Scandinavian rites to place a tree atop a new building to appease the tree-dwelling spirits displaced during Construction. (Leah Hogsten | The Salt Lake Tribune) Kevin Washington, a project superintendent with Ludvik Electric said working on the new terminal building was a lot of controlled chaos during Wednesday's topping out ceremony to raise the last steel beams to a high point on the new Salt Lake City International Airport terminal building, Wednesday, May 23, 2018. The new $485 million terminal building will cover 866,087 square feet and used 11,000 tons of structural steel and 22 miles of steel piles. (Leah Hogsten | The Salt Lake Tribune) The Salt Lake City International Airport held a topping out ceremony to raise the last steel beams to a high point on the new terminal building, Wednesday, May 23, 2018. The new $485 million terminal building will cover 866,087 square feet. It used 11,000 tons of structural steel and 22 miles of steel piles. The building will house a 6.2 mile conveyor system for baggage. (Leah Hogsten | The Salt Lake Tribune) Salt Lake City mayor Jackie Biskupski chats with Therill Two prior to the topping out ceremony to raise the last steel beam on the new Salt Lake City International Airport terminal building, Wednesday, May 23, 2018. The new $485 million terminal building will cover 866,087 square feet. It used 11,000 tons of structural steel and 22 miles of steel piles. (Leah Hogsten | The Salt Lake Tribune) Construction workers from various trades celebrate the last steel beam on the new $485 million, 866,087 square foot, Salt Lake City International terminal building, Wednesday, May 23, 2018. (Leah Hogsten | The Salt Lake Tribune) Iron Workers Local Union 27 rig the last steel beam with a tinsel decorated tree during a topping out ceremony at the new Salt Lake City International terminal building, Wednesday, May 23, 2018. Such ceremonies can be traced to Scandinavian rites to place a tree atop a new building to appease the tree-dwelling spirits displaced during Construction. (Leah Hogsten | The Salt Lake Tribune) Iron Worker Bob Lane and crew with Local Union 27 positioned the last steel beam, topped with a tinsel decorated tree, during a topping out ceremony at the new Salt Lake City International terminal building, Wednesday, May 23, 2018. Such ceremonies can be traced to Scandinavian rites to place a tree atop a new building to appease the tree-dwelling spirits displaced during Construction. (Leah Hogsten | The Salt Lake Tribune) Iron Workers (not in order) Mike Herrera, Chance Bogue, Curtis Loya, Kevin Johnson, Jeff Wilber and Irving Benally with Local Union 27 celebrate the last steel beam with an unfurled American Flag and a tinsel decorated tree during a topping out ceremony at the new Salt Lake City International terminal building, Wednesday, May 23, 2018. Such ceremonies can be traced to Scandinavian rites to place a tree atop a new building to appease the tree-dwelling spirits displaced during Construction. Construction is funded by federal grants, user fees, general airport revenue bonds and reserves. 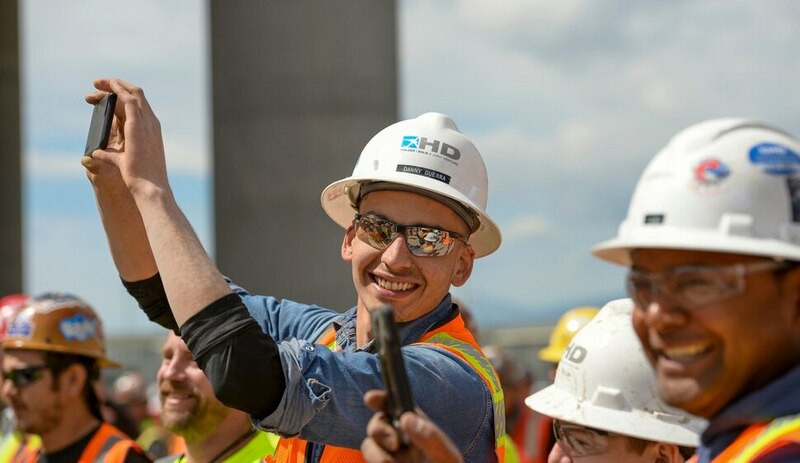 (Leah Hogsten | The Salt Lake Tribune) Thousands of workers from various trades attended Wednesday's topping out ceremony to raise the last steel beams to a high point on the new Salt Lake City International Airport terminal building, Wednesday, May 23, 2018. The new $485 million terminal building will cover 866,087 square feet and used 11,000 tons of structural steel and 22 miles of steel piles. The $1.8 billion project will be built in phases and is planned to be complete in 2023. 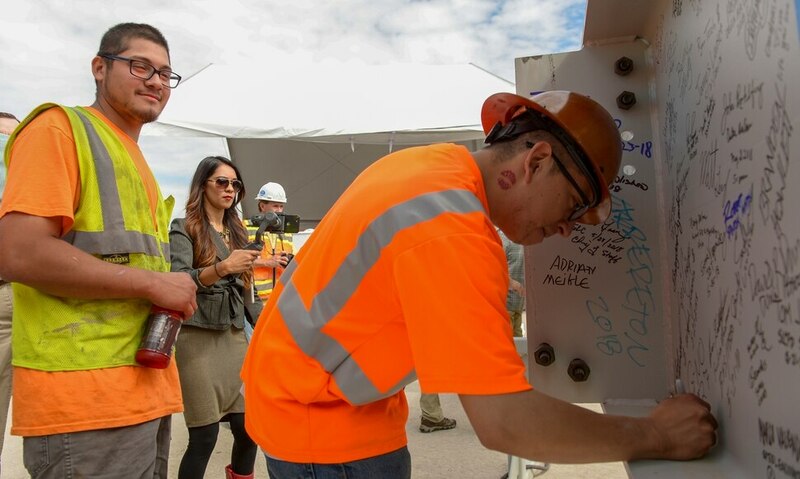 (Leah Hogsten | The Salt Lake Tribune) Attendees signed their name to the beam during Wednesday's topping out ceremony to raise the last steel beams to a high point on the new Salt Lake City International Airport terminal building, Wednesday, May 23, 2018. The new $485 million terminal building will cover 866,087 square feet and used 11,000 tons of structural steel and 22 miles of steel piles. Salt Lake City International Airport held a “topping out” ceremony Wednesday for its new terminal to celebrate the final beams placed there. Such ceremonies can be traced to Scandinavian rites to place a tree atop a new building to appease the tree-dwelling spirits displaced during Construction. The new $485 million terminal will cover 866,087 square feet. It used 11,000 tons of structural steel and 22 miles of steel piles. The building will include a 6.2 mile conveyor system for baggage. The first phase of the terminal replacement project is scheduled to open in fall 2020, with an elevated roadway with one level for dropping off passengers and another for pick-ups. It will have a new parking garage with 3,600 stalls, and one central terminal to replace three existing ones.